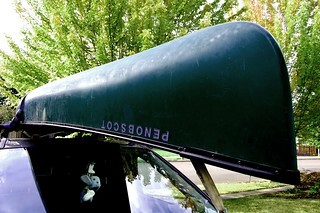 We just hung up the canoe for the season, a couple wishful weeks after our last weekend of good paddling weather. Our final days took us back to Tigard’s Cook Park, the same as day 1. This time we headed downstream to the I-5 bridge. With the exception of one shallow section with some rocks to navigate (river mile 9.3, see map), this was the most unobstructed section of the Tualatin we had yet paddled. 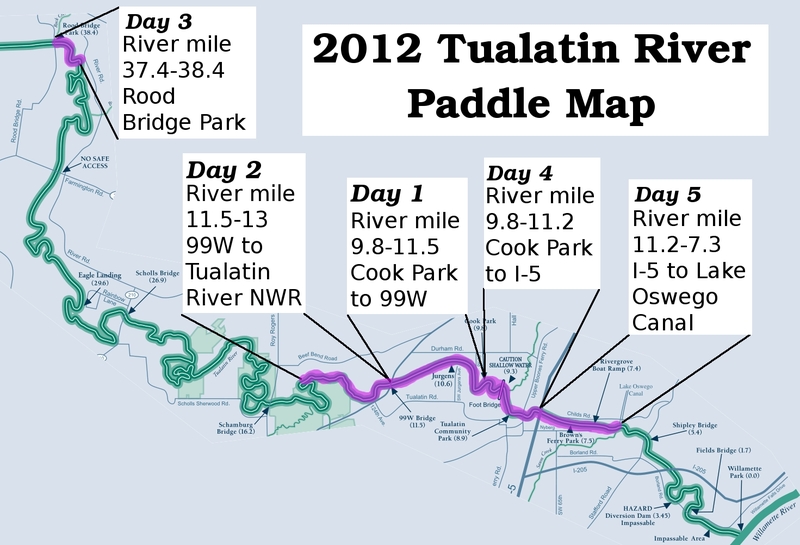 The next day, we put in at the Rivergrove boat ramp (river mile 7.4), and paddled back up to the I-5 bridge. Heading back, we decided to continue downstream on a broadest, straightest, most unobstructed stretch of the river we paddled, to the Lake Oswego Canal (just west of Wanker’s Corner, where we’ll start next srping). For our third paddle on the Tualatin River, we hoisted the barge on top of the van and headed to Hillsboro’s Rood Bridge Park. Couple things about this park: 1) Damn, what a nice park. Clean, well maintained, and beautifully planted/restored. 2) It’s adjacent to the Rock Creek Advanced Wastewater Treatment Facility, which has significance we’ll talk about later. We first parked at the wrong end, where they were setting up for a wedding (or was it a quincea�era?). After a stroll through the grounds to a map, we drove to the other end of the park (take a right when you enter, not left), and found the river access point. There are a half dozen parking spots there, and a steep ramp that ends in a rough and steep dirt put-in area. Not ideal, but doable. Tualatin Riverkeeprs notes that there are many impassable logjams just upstream from this spot, so we headed downstream. There was more current than our first two days of paddling, so we enjoyed a nice coast through a riverscape that could have looked the same 500 years ago. It’s so quiet once you get on the river, just birds and the breeze and the trickling sound of the water against the hull. There were quite a few logs and trees to dodge, and just ahead a splashing sound and… white water? No, couldn’t be. But something was going on. The water was foamy, and the closer we got, we could see there was some kind of high volume underwater discharge roiling the surface. What could it be, we wondered. Anyway, there was a sign about it being “clean water” yada yada “air bubbles may cause harmless foam” yada yada and holy crap, we’re paddling through sewage. Didn’t smell too bad. Oh wait. It was a little stinky, but we convinced ourselves that it was just the usual river stank from algae and fish. We paddled on. Until we heard thunder. Yeah, thunder. And then again. And again and again. It was 87 degrees and sunny, but somewhere just over the left bank there was a thunder cell unleashing frequent lightning. We turned back, judging it not the best place to be in a thunder storm. The banks of the river are very steep and thick with vegetation. No place to take out. So we paddled hard against the current, the storm cell seeming to pace us to our right, past the poop plant and back to Rood Bridge under a light sprinkle. We landed between crawdad traps a couple had placed just after we put in, and hauled out. It’s a ten mile stretch from this spot to the next access point down river, so we probably won’t do this again until we’re ready to do a two-car one-way trip (next summer?) Next up (today, if weather cooperates): Schaumburg Bridge downstream to where we left off on day two. Day 2, and we picked up where we left off yesterday: River mile 11.5, where OR Highway 99W crosses the Tualatin River on the south side of Tigard. 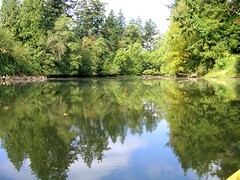 We paddled upstream to the edge of the Tualatin River National Wildlife Refuge. 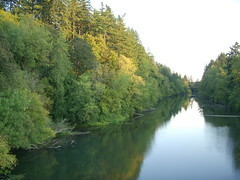 The Tualatin River is flows mainly through farm land, but there is some exurban development and a little river-front property. The 4.2 miles we’ve paddled so far is predominately wooded, pretty much like the picture above (not sure exactly where this one was taken). River travel gives an uncommon view into a world filled not only with all kinds of wildlife and trees and shrubs draped over placid waters, but derelict irrigation pumps, makeshift riprap, wrecked and working docs, decks and gazebos perched high on the river banks, precarious stairways and ladders to the water, and not as much trash as you might expect (thanks in no small part to the efforts of the Tualatin River Keepers). Our only wildlife close encounter today was an adolescent female mallard, swimming on a collision course with us from 12 o’clock. We stopped paddling, but she kept at us, only veering away at the last minute, intent on her hunt. And a couple of buzzards, who apparently don’t have as much confidence in our seamanship as we do; they always seem to be around when we’re out. So not as much wildlife today as yesterday, but we did see some colorful human denizens in the water cleaning up a fallen tree to the dulcet tones of Green Day. Next up: put in at Shamburg Bridge (River mile 16.2) and go downstream to where we left off today. Nancy and I are on a new mission: canoe the safely navigable length of the Tualatin River. Most of the Tualatin Valley’s population is north of the river’s course, which runs out of the Coast Range near Hagg Lake and meanders through agricultural land and the Tualatin River National Wildlife Refuge south of Suburban Portland’s urban growth boundary. In our neck of the woods, it cuts between Cooper Mountain and Bull Mountain to the northeast and the Chehalem Mountains (Bald Peak) to the southwest, on its way to the Willamette River in West Linn. Tualatin Riverkeepers, a nonprofit org dedicated to preserving and restoring the river, maps (PDF) about 33 miles of navigable water. 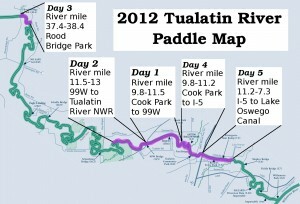 This morning we paddled upstream from Cook Park (mile 9.8) the the 99W bridge (mile 11.5) and back. Next up: 99W upstream into the Tualatin River National Wildlife Refuge.